As in Augusts past, I’m enjoying Susannah Conway’s “August Break” photo challenge. Today’s prompt was “One Wish” and I woke up thinking that I have so much of what I once wished for, for which I’m very grateful. But as for a personal wish to photograph today, I’d just have to keep my wishful eyes open. I had a small act of service to complete before noon. I’d volunteered to buy and deliver groceries to a summer camp for refugee children near Lake Merritt. I loaded up the requested bags of fruit and pasta makings and headed for downtown Oakland. I hadn’t been to that particular location for years–not since my own children were young and taking boating lessons. There was some lag time between my arrival and the refugee children and so I watched other children take off in sailboats, kayaks and paddleboats. They looked like they were having so much fun doing boating activities that I don’t really know how to do. (I grew up waterskiing in Idaho, but that’s about it.) I wished that I knew how to paddle about in a kayak or maneuver a sail to get where I wanted to go. And then I thought that I could still take lessons to do either. But almost immediately realized that I didn’t really want to LEARN how to do those things. I just wish I KNEW how to do them. 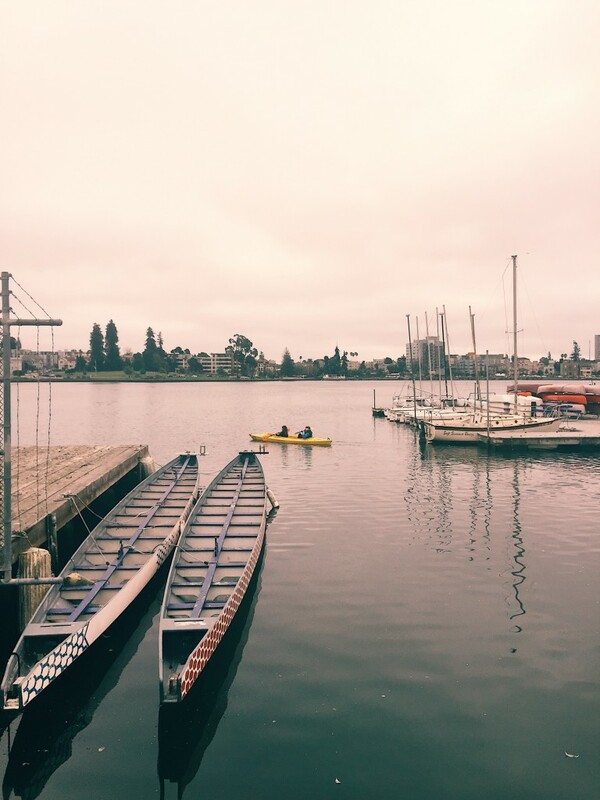 They seemed engaged and excited to be gathered by a manmade lake in the middle of downtown Oakland on a foggy August morning. But I wondered if they, too, sometimes wished they KNEW it all without having to learn everything anew. Here’s wishing you a wonderful August. This entry was posted in Spirit and tagged August, children, photo challenge, refugees. Bookmark the permalink. Post a comment or leave a trackback: Trackback URL.